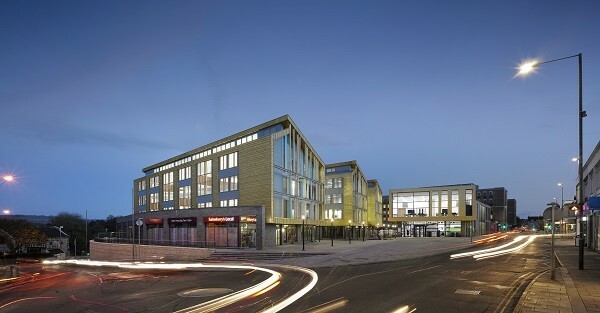 AHR has completed the new Keynsham Civic Centre and One Stop Shop for Bath & North East Somerset Council. 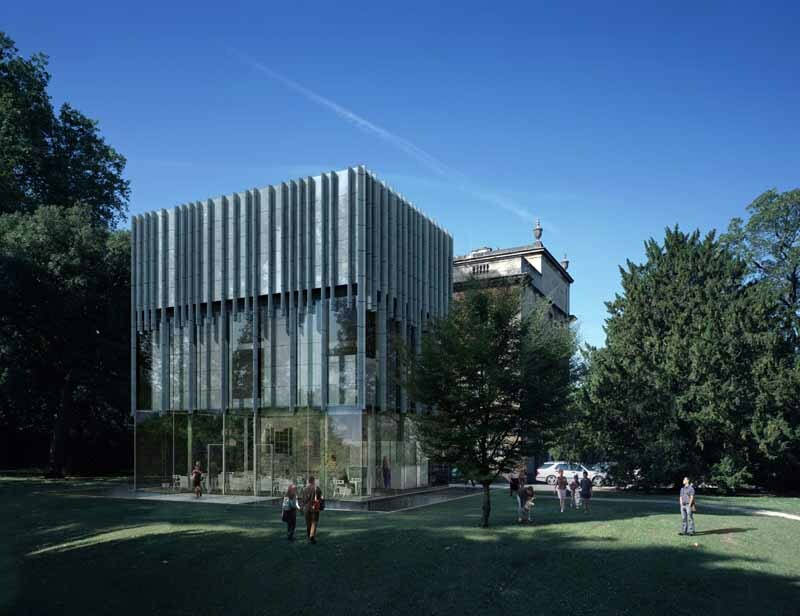 In addition to providing the Council with high quality offices, civic facilities and public realm which will reinvigorate Keynsham town centre, the project is on course to be one the lowest energy consuming public buildings in the UK targeting a DEC A rating. 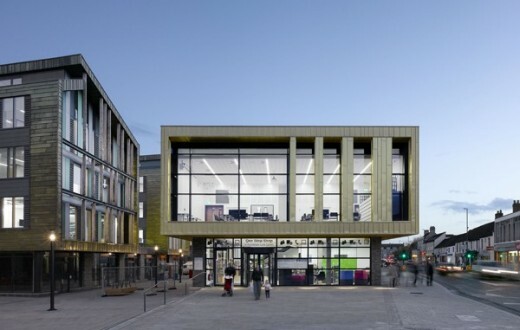 Keynsham Civic Centre has recently won a number of prestigious awards including RIBA South West Award, RIBA South West Sustainability Award, and British Council for Offices Corporate Workplace and Innovation Awards for the South West, Thames Valley & South Wales region. The new development has replaced 1960s buildings to provide 68,000sqft council offices, a library and one-stop shop, 20,000sqft retail, two new pedestrian streets, a market square, car parking and highways improvements. 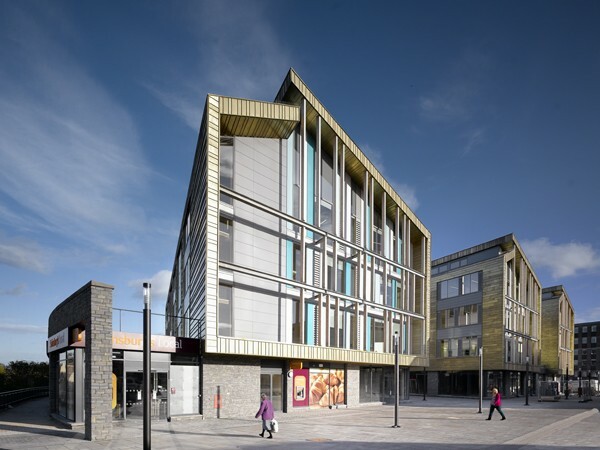 AHR responded to the challenge of the constrained and sloping town centre site creating two new pedestrian streets and a cluster of inter-locking buildings. This allowed over 50% of the site to be given over to new public realm and better integrated the development into the existing urban grain. 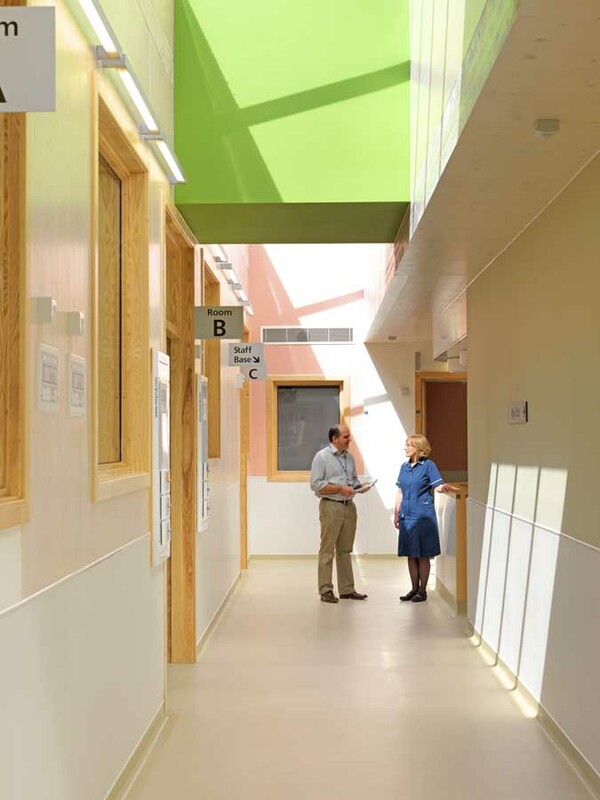 Careful orientation of the buildings and an innovative acoustic louvre window system allowed full natural ventilation to be used throughout, despite the location within a busy town centre. 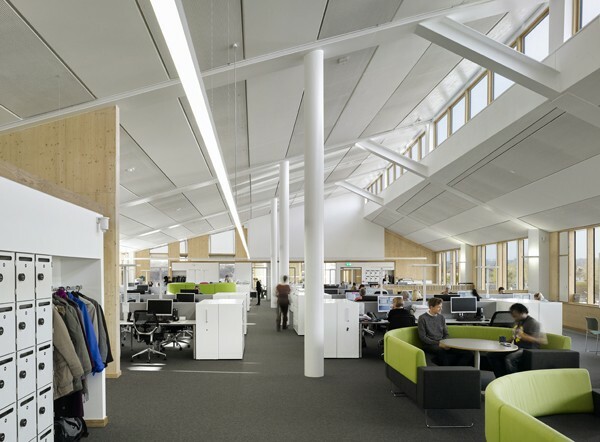 At the heart of the brief was Bath & North East Somerset Council’s objective of creating a highly efficient, robust and flexible building that would minimise energy consumption and maintenance while providing first class civic facilities and a high quality workplace embodying a ‘one council’ culture. AHR has built on extensive in-house research and worked closely with Environmental Engineer Max Fordham to develop a pioneering environmental strategy for the project: it is the first in the UK to implement BSRIA Soft Landings to target an exemplary DEC A rating, which it is expected to achieve in 2017 once it has been in use for two years. 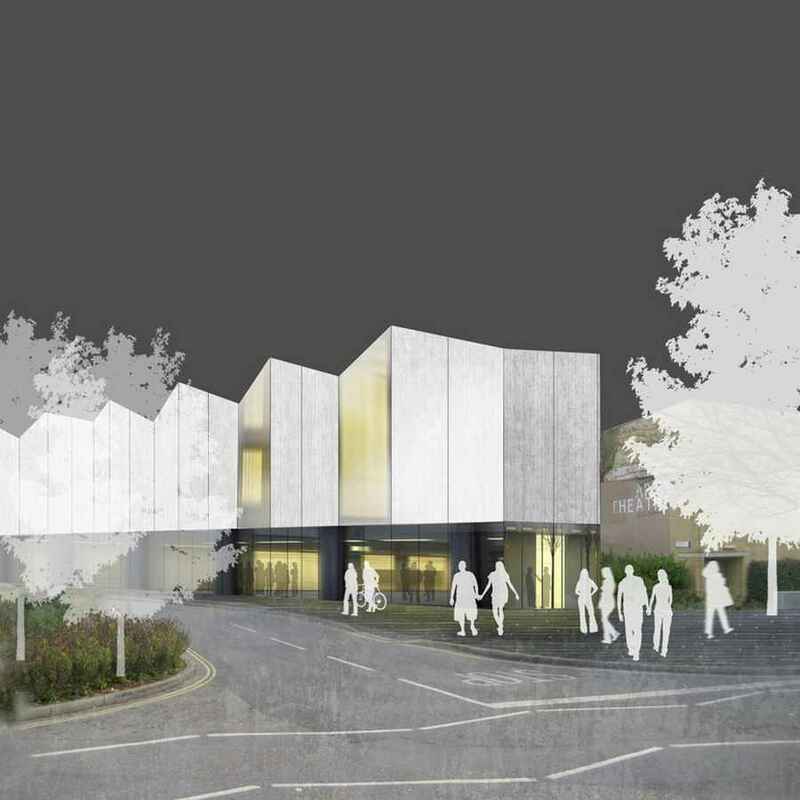 This rating will confirm Keynsham Civic Centre as one of the lowest energy consuming public buildings in the UK. 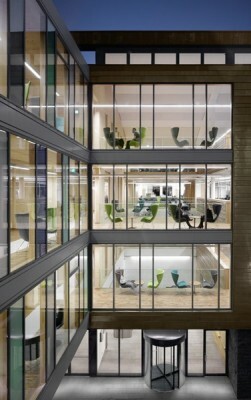 The offices have already achieved an outstanding EPC A rating and the project is almost carbon neutral. Every aspect of the design of the building was considered to provide optimal environmental performance, starting with the building’s orientation and form which reduced the requirements for mechanical ventilation and lighting. 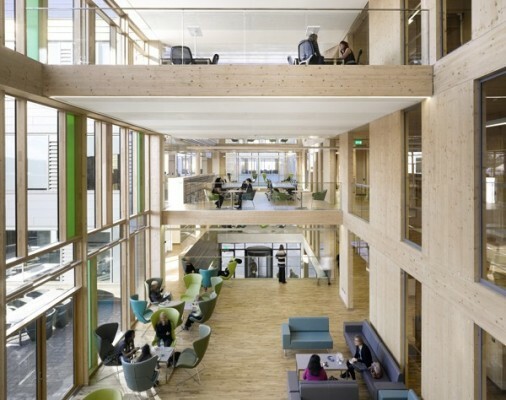 An innovative timber (CLT), steel and concrete structure not only created bright and welcoming interiors but also reduced heating requirements and construction time. One of the key objectives for the project was to facilitate a workplace transformation, allowing the Council to adopt a more flexible way of working which would also improve communication, collaboration and efficiency across teams and departments. AHR responded to this by arranging four wings around a central atrium which incorporates a large breakout area two touchdown decks. The atrium is the heart of the building, creating visual connectedness and opportunities for spontaneous meetings as users move across the building. Keynsham Civic Centre has provided Bath & North East Somerset Council with a landmark building which positions it at the heart of the community it serves and which embodies its commitment to that community and to its staff to be an exemplary Council, investing wisely, making a positive impact in every aspect of its work and looking to the future. 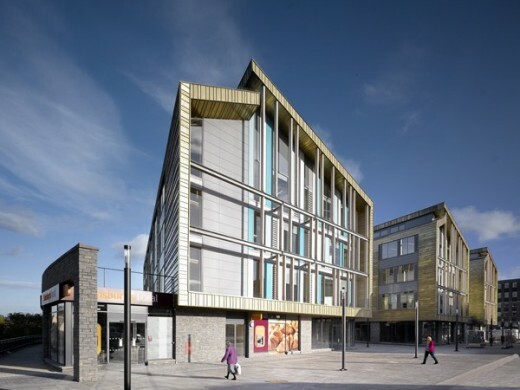 Adam Spall, Architect at AHR who led the design of Keynsham Civic Centre, said: “AHR was very pleased to be selected to design the new Civic Centre as it was clear from the outset that the brief was both pioneering and challenging, aspiring to the highest standards of sustainable design. This project is much more than a new office building for the Council: the ambition of the client has been to spark regeneration, enhance the public realm, improve connectivity, and instil community ownership in the project.